CKAP Log forms are available in Excel and Pdf Format. If you are filling out a form by hand please use the PDF Form – blank form. If you email your log please save a tree and don’t send the co-ordinator another log when mailing in your payment for awards in the incentive part of CKAP. Click on required log and save cycling log in a folder on your computer. Navigate to folder where you saved the log. You will see that the logs have been formatted in whole km and when entered they will show in the colour red, as well as the Quarterly Totals. Type your km directly into the log but all other information requires the use of the formula bar at the top of the screen. All cell that require you to add your information have been formatted with the margin set to “Left” this will allow you to type through one cell into the next but only when using the formula bar. Start by clicking on the “CKAP No.” on the top left hand side of the log. This will put it into the “Formula Bar” at the top of the page, where you can type in your CKAP number. Once done click the log to return that information to the log and go on to the address section, which is done in the same manner. Some lines which require your “X” mark use the whole line as a cell. To put those lines in the formula bar, click on the extreme left of the line (page row number) and proceed in the same manner. If you wish to color your information, put the cell into the formula bar and highlight just your information, then click the arrow on the right of the large “A” at the top right of your screen and select a colour, click on it, this will put it under the “A”, then highlight each part of your address information and click on the “A”each time. Please remember to delete the “0” for your Grand Total and add your Grand Total in the same cell that you deleted the “0”. Your Grand Total is the total of all your CKAP recorded logs combined up to the end of your last log. You can find your Grand Total on the CKAP Members Page on the CKAP web site to know that you have done this correctly your past Grand Total will also be added to your current years Grand Total. Remember to save your information before you exit log. Completed Excel logs can be sent as an attachment to a email (please don’t inbed in the body of the email) as they don’t print well. You can add your comments for “From the Peloton” to page two of the log or in the body of your email. Your CKAP Coordinator will print your log and your email on the back of the log if you don’t use page two. If you owe for an award you please mail your cheque and make it payable to CKAP. Badges are $10.00 and medals are $20.00 each. 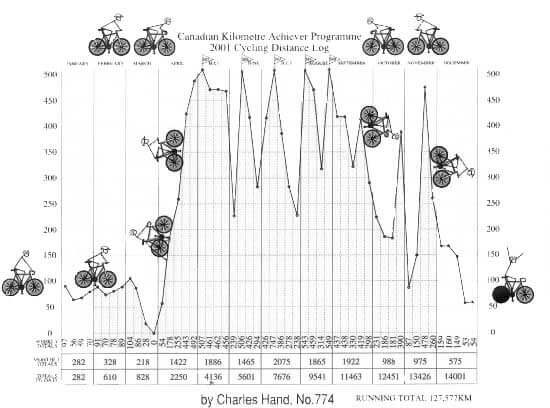 As all CKAP’s km are cumulative you only earn and pay for these awards in the 1,000 to 25,000 km incentive program, once. All major awards are free. Remember you helping to pay for your future free award when you pay for the awards in the incentive part of CKAP CKAP has no annual fees. If you have the full Adobe Acrobat program (not many do as it’s expensive) you can complete it and save it to your computer and then email it as an attachment. If you are good with a mouse you can even sign it! Have your PRINTER set in PORTRAIT format. Click on required year CKAP log. The Tour du Canada Award Information is on the back of the cycling log.